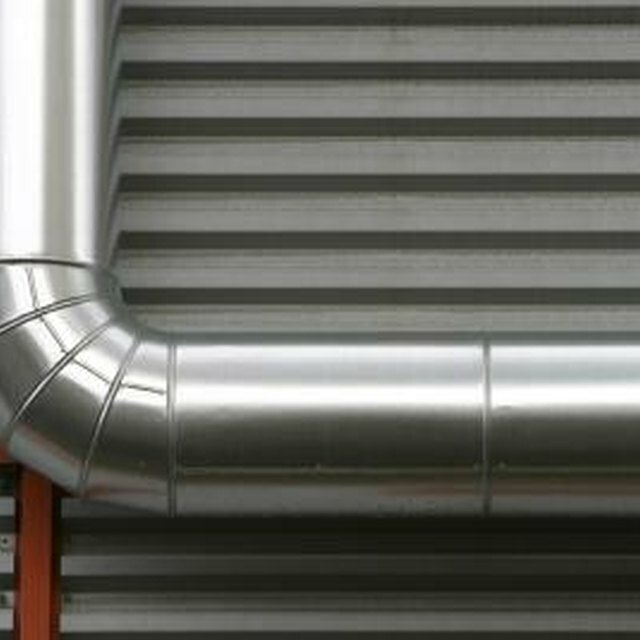 Although building your own ductwork won't save you much money, it can help you route an air exchange and delivery system in the most efficient way. One of the major considerations you should make when fabricating your own duct work is the type and amount of insulation you will use. According to the U.S. Department of Energy, up to 60 percent of heated air can be lost before it reaches the registers. This is especially true if the air travels through ducts that aren't insulated in unheated spaces like the attic or crawlspaces. Mixing homemade ductwork with flexible pieces allows for a custom system. Measure the size of the opening into which you have to install the duct. Subtract 1 inch from each measurement (length, width and depth) to account for insulation and hangers. Rectangular ducts are the easiest to produce on your own for DIY projects. For example, if you have an opening for a run in your crawlspace that is 10 inches tall by 6 inches wide by 2 inches deep, you'll want to make the duct 9 inches by 5 inches by 1 inch. Remember, the smaller the duct, the higher the air pressure inside it will be. Large ducts will produce a less forceful air current out of the register. Transfer the length measurement to a piece of 30-gauge aluminum sheet. Mark the length with a scratch from the tin snips. Also make the width and height measurement (this distance will be the sum of two times the width plus two times the height). Mark the height and width with the tin snips as well. Mark them alternately, as they will be reference points for when you bend your duct. Cut out the template you've created with a pair of tin snips. Be sure to wear heavy gloves because the edges of the cut aluminum will be sharp. Set the piece of aluminum you have just cut on top of a saw horse so that the first width marking is aligned with the edge of the saw horse cross member. Bend the aluminum using the saw horse as a stabilizer (one hand holds the aluminum down on the saw horse while the other pulls the bend into shape). Slide the aluminum sheet forward to the next marking and bend again. Continue this until you have created an open-ended rectangle. Tape the joint of the duct with duct tape to keep it secure. Wrap the duct with fire-resistant duct wrap insulation and cut it to size with a pair of scissors. Keep your gloves on during this process as several duct wraps are made with fiberglass. Secure the duct wrap in place with foil backed aluminum tape. Your piece of duct is now ready to install by whichever method you have chosen.